Prime Minister Binyamin Netanyahu plans to “give it” to Economics Minister Naftali Bennett when he returns from Poland, where he joined MKs and ministers to commemorate International Holocaust Remembrance Day. Netanyahu is fuming over Bennett's harsh criticism of his “plan” to allow Jews to remain in their homes under Palestinian rule in the event of a final-status settlement. Ha'aretz reported that Netanyahu was upset that Bennett had ruined his “gambit” to expose the Palestinians as anti-Semitic. Last week, Netanyahu proposed that Jews be allowed to remain in their homes in Judea and Samaria, even if the towns they were living in came under Palestinian rule. As expected, the PA said it would never agree to this, and that it expected Israel to hand over all lands “Judenrein.” This, Ha'aretz reported, was Netanyahu's plan. But Bennett rallied right-wing groups against the plan with his comments, the report said. 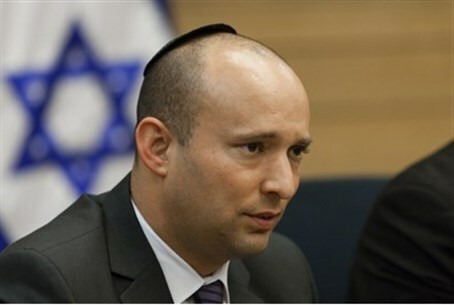 “The idea that Jewish communities will live under Palestinian sovereignty, as expressed by the Prime Minister's Office, is a very grave matter, and it reflects a panicked loss of values,” said Bennett. "2,000 years of longing for the Land of Israel did not transpire so that we could live under Abbas's rule.” By saying this, Netanyahu sources said, Bennett had deflected the attention from where it belonged, on Palestinian intransigence. Now, Bennett would “pay” for his actions, the report said. “A year after the elections, these kinds of actions on his part are not acceptable,” a senior official quoted by Ha'aretz said. “Even Yair Lapid has had enough of him,” the source said, citing several recent public tiffs between the two.